Last weekend, we needed to come up with a sweet baked brunch treat to bring to our friends’ house for a long awaited get together. Little did we know, whatever we brought had to compliment yummy savory quiches (2 types! ), a fresh fruit salad & perfectly slow brewed coffee (Stumptown in a Chemex…more on that in a future post). We made scones & it was, after all, a delicious & adorable visit (complete with a baby AND a pup!). Well, since we’ve had good luck refrigerating similar types of dough, we figured that refrigerating the cut & prepared scones overnight couldn’t hurt. So…we made the dough for the two recipes, cut the scones & put them on cookie sheets, covered them & popped them in the refrigerator (precariously balanced on containers of milk and pickles and stacked Chobani yogurt). We tossed them in a preheated oven the next morning. They took a little bit longer to bake (just a few minutes) but it worked out perfectly in the end. Today, I’ll share our favorite of the two recipes with you. 1. Place a rack in the center of the oven and preheat oven to 375 degrees F. Line a baking sheet with parchment paper & set aside. 2. 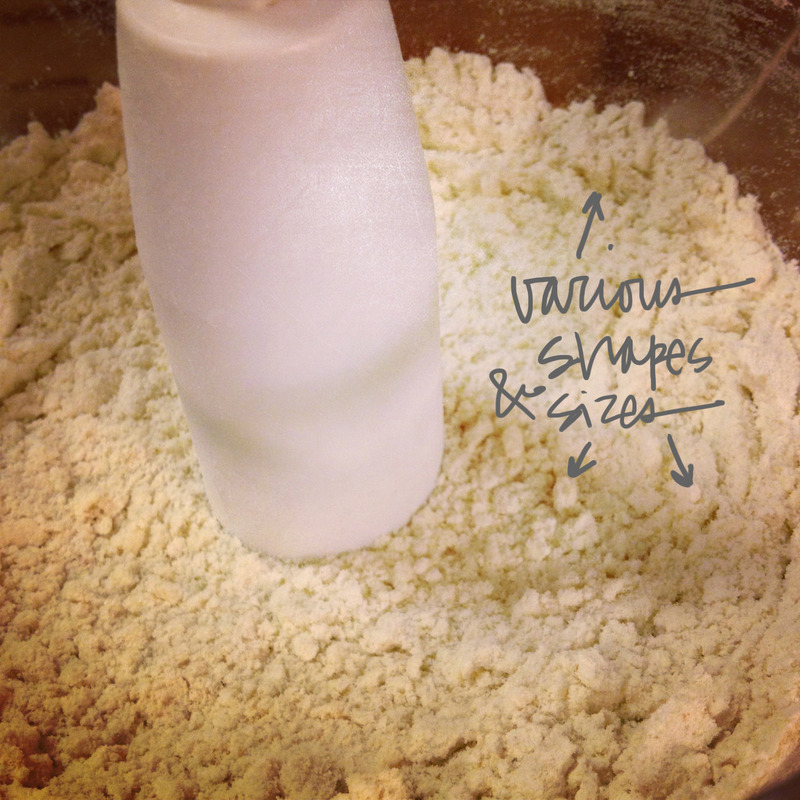 In a food processor, add flour, sugar, baking powder & salt. Give a quick pulse to mix the dry ingredients. Add the cold butter & process until the butter is well incorporated in the flour mixture. Some butter bits will be the size of peas & some will be as small as oat flakes. Don’t panic, this is exactly how it should be. 3. In a small bowl, whisk together the egg, vanilla extract and heavy cream. Add the cream mixture all at once to the flour mixture in the food processor and process until everything comes together & forms a ball. Do not over mix! 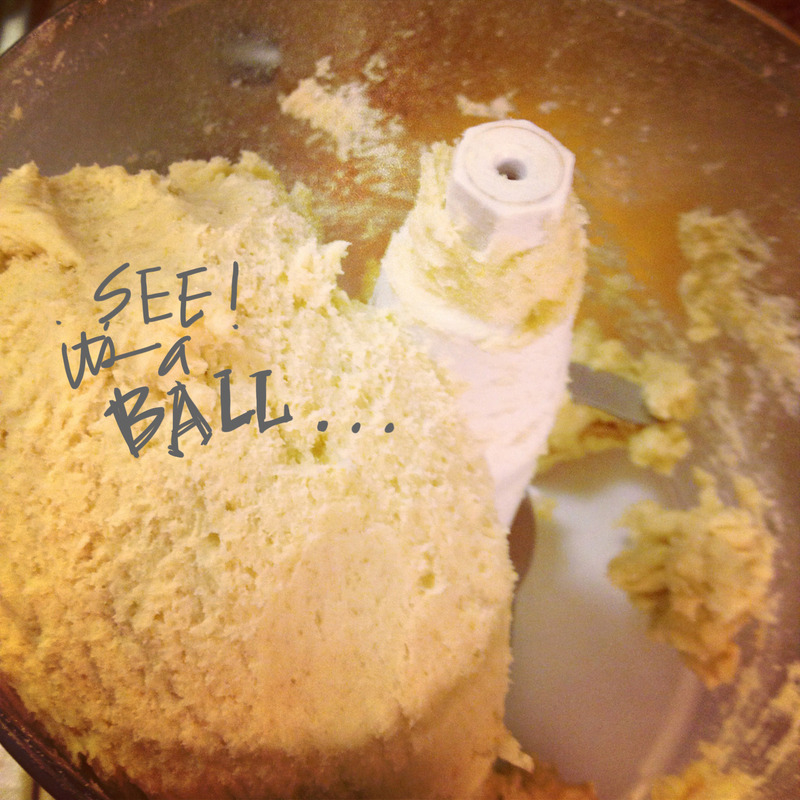 It will be very obvious when it happens — the ingredients suddenly combine to form a ball – it’s a little magical & less messy (no kneading required…yay!). 4. On a floured work surface, divide the dough in half and press each into a roundish disk. 5. 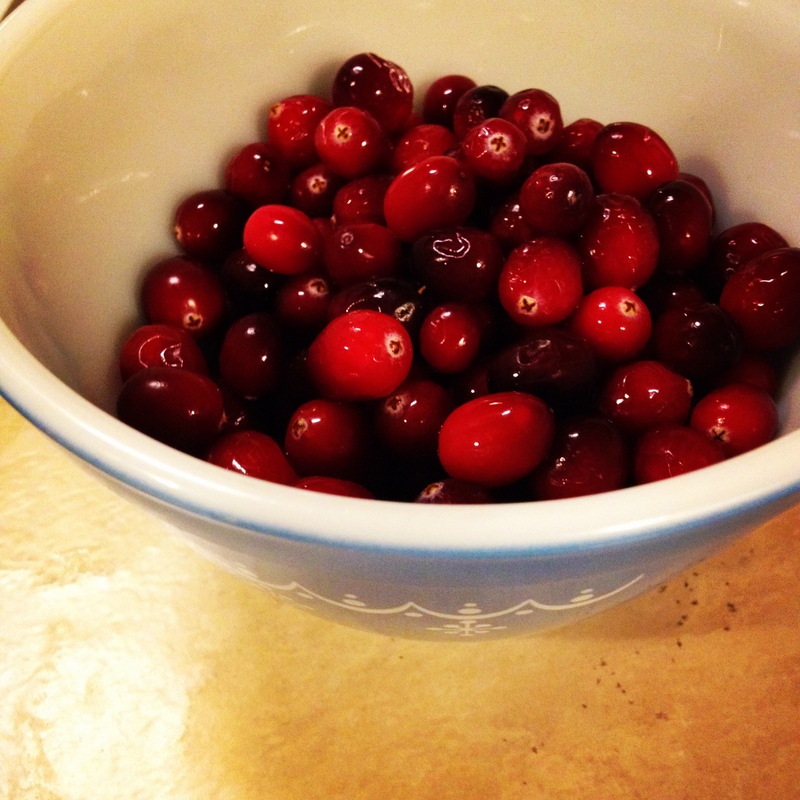 In a small bowl, toss the cranberries with orange zest. 6. Press the zesty cranberries onto one half of the dough & then place the other half of dough on top. Congrats! 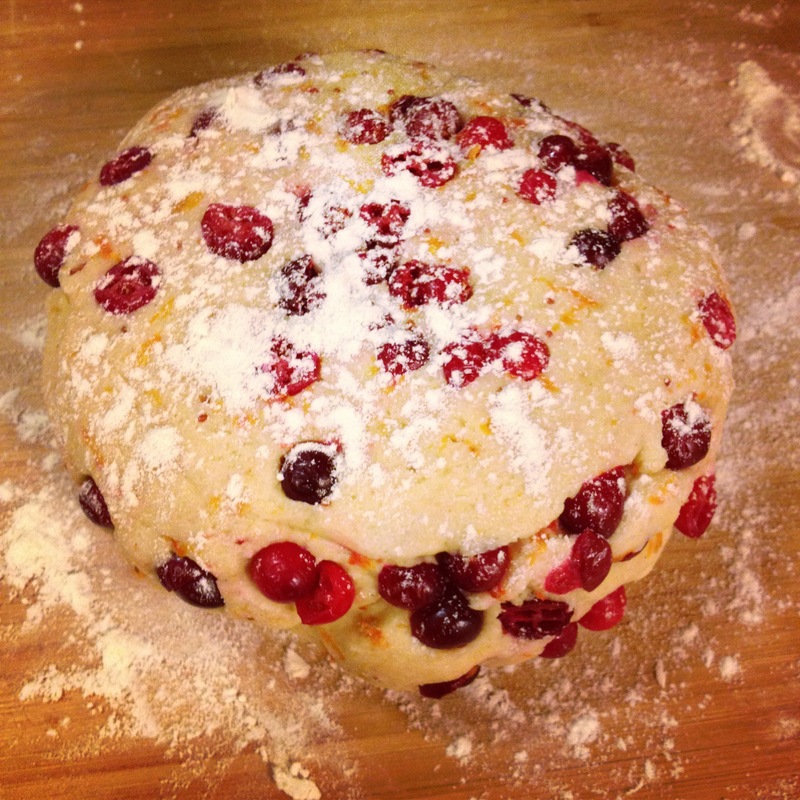 You’ve made a zesty cranberry filled dough sandwich…mmm! Fold the stacked cranberry dough in half a couple of times to combine the cranberries. It will seem like there are a lot of cranberries poking out. It’s okay. You don’t want to over knead the dough. 7. Pat the dough into a 1 ½ inch thick disk. 8. Cut the disk into 6 wedges. 10. Bake for 15 minutes until just cooked through. Remove from the oven and allow them to cool on a cooling rack. 11. As the scones are cooling, in a small bowl, combine the O.J., confectioner’s sugar and honey with a fork or whisk. 12. Once the scones are cool, place a baking sheet under the cooling rack (for easy clean up!). 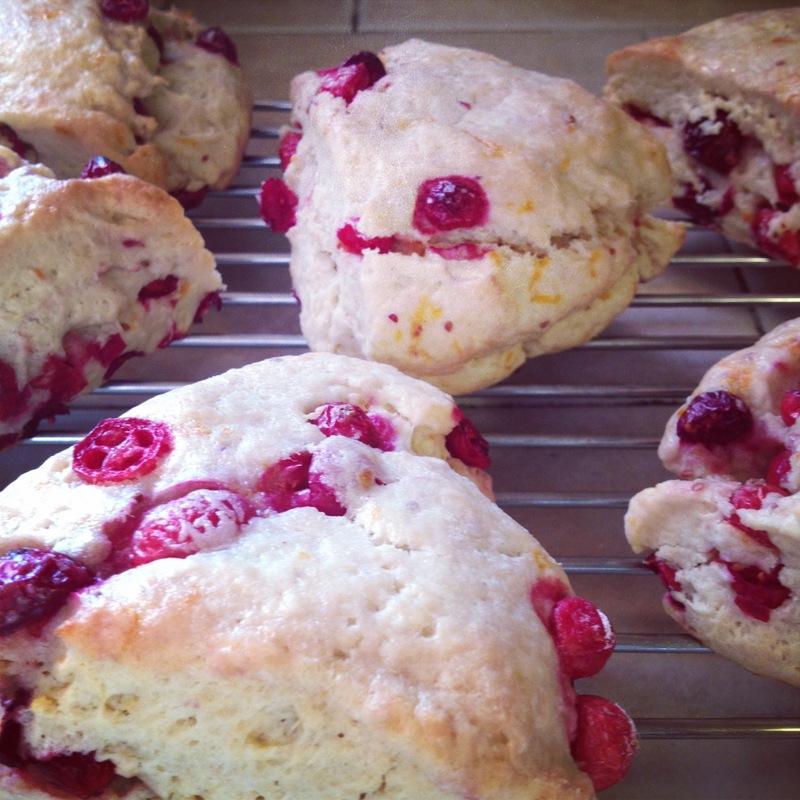 Use a tablespoon to drizzle a little glaze on top of each scone. Let the glaze set before placing the scones on a plate or wrapping them up (this will take about 10-15 minutes). Serve at room temperature or warm them slightly in the oven before serving. Scones are best when served the day they are made, but these will last well wrapped at room temperature for up to 3 days. The result: A tasty scone with really great texture (not too dry & not fluffy or biscuit-like). The tart cranberries & bright orange zest perfectly balance the sweetness of the sugary glaze. We only wish the recipe made more! these look so good. will definitely try this recipe!